Trust Funding We have been offered some funding from a charitable Trust to help with the costs of a farm visit to your school - please see our news page for further information. Handwashing We can hire out mobile hand washing sinks which provide soap and hot running water - the ultimate in recommended hygiene practice! Contact us for details. 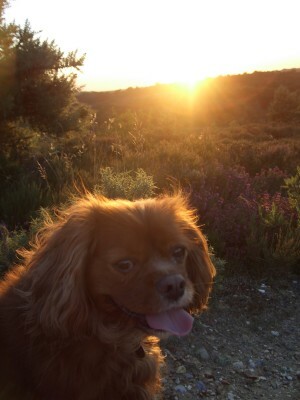 We have two Cavalier King Charles Spaniels: Amber and Alfie are Blenheim (chestnut & white). You can also get Ruby (chestnut coloured all over, like Chester), Black & Tan (black all over with tan over the eyes etc) and Tricolour (black & white with tan over the eyes etc). Amber was born in December 2008 and was rehomed with us in February 2011, Alfie was born in 2009 and was rehomed with us at the same time as Amber. Amber and Chester used to enjoy rough and tumble play whilst Alfie looked on in an amused way. Alfie is the joker of the pack - he is such a character and really makes us laugh at his antics! Both dogs have been neutered so they will not be able to have puppies. They live in our house but they are not allowed on the furniture or upstairs. 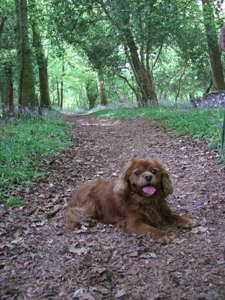 For some years Chester suffered from a heart murmur (common in this breed) and so he had to have two tablets a day. He had been growing steadily worse during 2012, and by early July was clearly suffering too much. Knowing there was no more that could be done, we had a vet appointment booked for 9.40am on 5th July, and were going to ask for Chester to be put down. Instead, at 8am he walked out onto the patio, lay down and died. Guarding the patio to the end! Glad he died at home in his own time. He had been such a lovely dog and had a good life.